FRANCE – Arcs sur Argens - Sur la commune des Arcs-sur-Argens, non loin de la gare, une fouille préventive a été lancée en novembre sur une parcelle de terrain destinée à accueillir un lotissement. Les archéologues de l'INRAP (institut national de recherches archéologiques préventives) ont mis au jour un site attribué à la préhistoire récente (entre 3500 et 2000 ans avant Jésus Christ). Sur près de 3500 m2, les fouilles ont permis de révéler des vestiges de fours, de différentes tailles et de différentes natures, creusés dans le sol, au début de l'âge de bronze. «Nous avons trouvé des foyers à pierres chauffantes de deux types. Les plus petits sont alignés sur un axe Nord-Sud. Les plus grands et plus profonds mesurent 2,50 mètres de long et 1,50 mètres de large. A l'intérieur, il reste des traces de combustion», explique Denis Dubesset, le responsable du chantier. Il semble que les archéologues de l'INRAP aient mis au jour une véritable «cuisine» préhistorique. Aucun vestige d'habitation n'a été retrouvé sur place. 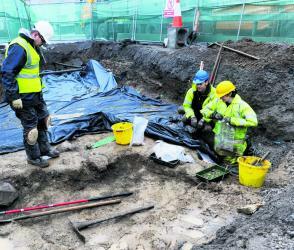 IRLANDE - Galway - The remains of up to a dozen people, possible victims of the Great Famine in the 19th Century, have been discovered in a grave in north Galway. The skeletal remains were uncovered by contractors working on the Tuam Public Water project and archaeologists were immediately called in. The neatly arranged skeletons were discovered close to where an old workhouse stood, on the Athenry Road on the outskirts of Tuam town. The skeletons were found by workmen in a contained area, and all appeared to have been buried in coffins, rather than just left at random in the ground. Mysteriously, all were discovered facing in a north-south direction. 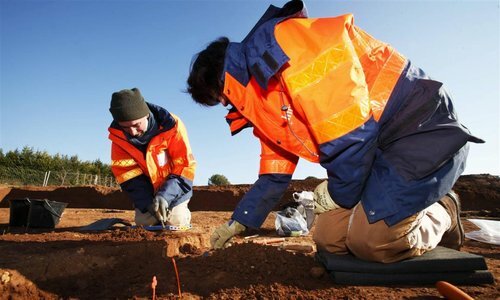 "Most Christian burials saw the bodies laid in an east-west direction, so we are not sure why they are lying like this," said Galway County Council archaeologist Finn Delaney. 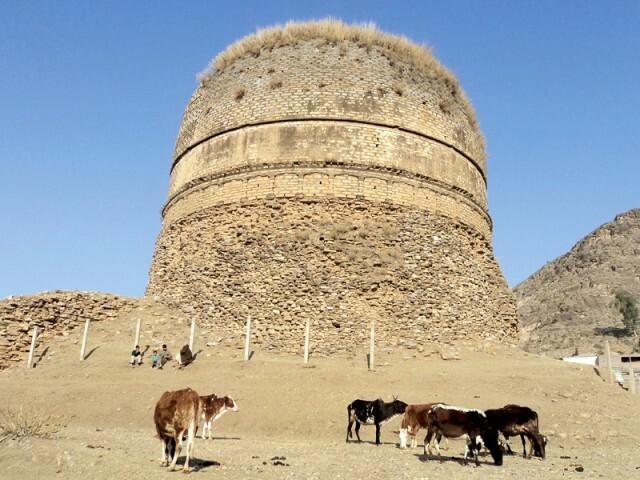 PAKISTAN – Ghalegey - A short distance from GT Road in Ghalegey village lies Shingardar Stupa, a renowned Buddhist tourist attraction. Once swarming with visitors, now desolate and neglected, it has fallen into disrepair. Poles minus the barbed wire stand out in the midst of garbage in what now serves as a children’s playground. The Shingardar Stupa, identified by Colonel Deane and SA Stein, was built by King Uttarasena. It is believed that the monument was built on the spot where the white elephant which carried the king’s share of Buddha’s relics, halted. The elephant dropped down and turned into a rock. By the side of the rock, the king erected the stupa. There is a controversy regarding the stupa since some historians dipute the fact that it was built by King Uttarasena or that his elephant turned to stone. Originally, the platform of the stupa was square in plan. However, locals removed the well-dressed stone and most slabs around the podium to construct houses and roads. Large dressed slabs of white stone separated by small columns of dark slate pieces adorned the stupa. GRECE - In a move bound to leave many Greeks and scholars aghast, Greece's culture ministry said Tuesday it will open up some of the debt-stricken country's most-cherished archaeological sites to advertising firms and other ventures. The ministry says the move is a common-sense way of helping "facilitate" access to the country's ancient Greek ruins, and money generated would fund the upkeep and monitoring of sites. The first site to be opened would be the Acropolis. Archaeologists, however, have for decades slammed such an initiative as sacrilege. The culture ministry said any renting of ancient Greek sites would be subject to strict conditions. According to a ministerial briefing dating from the end of December, a commercial firm could rent the Acropolis for a professional photographic shoot for as little as 1,600 euros a day ($2,046). Demonstrators could also rent the ancient landmark. ISRAEL - Beit Shemesh - Two antiquity thieves were apprehended at a Beit Shemesh-adjacent archeological dig where they managed to destroy ancient artifacts in their search for gold.The robbers, both Bedouin residents of Dimona, brought digging equipment to the Be'er Limon site late last week, and proceeded to operate there for several nights. On Thursday, in the pouring rain, the pair smashed the walls of a 2,000-year-old well located under a structure from the Crusader Period. They dug deep holes in the ground, causing what the Israel Antiquities Authority deemed as "irreversible damage."